I live and work in Montreal, Canada. I began painting in 2004, just before embarking in the Film Studies program at the University of Montreal. Although guided by plain curiosity in the beginning, painting quickly became an intriguing new field of artistic possibilities. My visual work has its roots in sculpture and design. Painting is for me no different from modelling, building and assembling objects in the physical world, since paint itself can take different forms, geometries, textures and opacity. 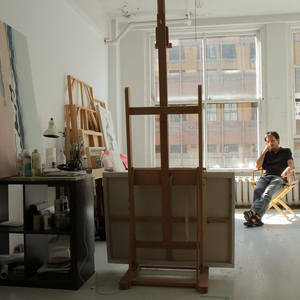 These variables can be used to give shapes a certain intention, direction, energy or personality, and I delight in the conflicts, contrasts and surprises that arise from the many parts of the painting, as if each shape strove to define itself in relationship with the the other parts of the painting. I aim for the beauty of universal forms, at times inspired by architecture or landscapes, and other times by photography or by biological forms. My compositions stem from a certain idea of the relationships that exist between the objects of the world. The world being nature, society or man-made environments. But my paintings can ultimately thought of as constructions of a more poetic realm, where they correspond to vague emotions, dreams and memories that would be difficult to describe by any means other than painting.